When it comes to hitting your peak performance on triathlon race day, Chrissie Wellington knows a thing or two. Wellington has won the prestigious Ironman World Championship race in Kona for the past three years in a row. And Shape.com caught her on her way to her flight to Hawaii for her fourth attempt on October 9. Lucky for any triathlete or tri wannabee, she wasn't caught up in talking about her sweet bike (Cannondale Slice) or her amazing year—which included breaking the course record at the Timberman Ironman 70.3 (with a lightening-fast 4:10:11) and finishing the Challenge Roth, Germany with the fastest ironman-distance time ever posted by a female (8:19:13). Wellington, known not only as a fierce competitor but one of the warmest people in the business, wanted to talk more about your peak performance on the racecourse, and your training for a triathlon than about hers. 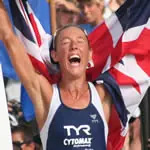 Of course, you don't have to be training for a peak performance in triathlon to get the most from Chrissie Wellington's top 10 tips. Use them any time you want to be at your best. Performance Tip #1: Passion Gets You Further Than Gear. "You've really got to be passionate and enjoy the sport and never lose sight of that. Amateurs sometimes get caught up in the minutia. You've got to have the latest bike and this, that and the other thing. You have to keep the love for the sport in mind." Performance Tip #2: More Isn't Always Better. "There's always a tendency to think that more is better, especially with regard to Ironman training. People think, 'I have my log book and I have to be a slave to it and log as many hours as I can.' Whereas for me, people are always surprised that I don't do as much volume as they think. Don't get me wrong; I work incredibly hard. But always err on the side of quality rather than quantity." Peformance Tip #3: Don't Be Afraid to Go Fast. "Lots of people go for long, slow, steady rides. If you ride long, slow and steady, you're going to race long, slow and steady. You have to go faster, harder and stronger in order to reach those faster times. There's a place for periodization and for not doing too hard of intervals too early in the season. But as race season starts, you want to change it up. There's still a place for those slow miles, but you also have to incorporate harder, faster efforts as well." Performance Tip #4: Rest Is As Important As Training. "Recovery is an integral part of training. People have their log books, and they tick everything off in all of the columns, but where's the column for recovery? That's the 4th pillar. Without that, the whole structure collapses. I break recovery down into nutrition, compression garments (which I wear), getting enough sleep, and resting between sessions. Also learning not only to relax your body but also relax your mind. Without recovery, I wouldn't be the athlete I am." Performance Tip #5: Train Your Mind, Too. "It amazes me how little time people spend on mental training. 30K into a marathon on race day is too late to figure out that you need to train your brain. There are many different tools you can use. Have a bank of positive images and songs. It doesn't have to be related to sport at all. That way, when the going gets tough—and it will get tough—you can draw on those images and have peace of mind." Performance Tip #6: Have a Mantra (or Two).